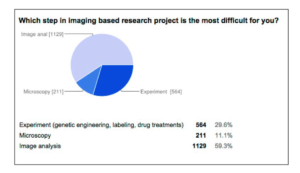 Imaging has become a key technique in life science to achieve high-standards research and results. Among the three major components of imaging: experiments, microscopy and image analysis, nearly 60% of life science researchers acknowledged that "Image Analysis is the most difficult part" during a survey we organized (n=1904). We believe that Bioimage Analysts are the key players in the field to overcome this difficulty (see Key Concepts for more details). NEUBIAS (Network of EUropean BioImage AnalystS) is an action fully funded by COST (CA15124). For more details, read "NEUBIAS Action" page. Network members are listed under this page, and to become a member, please visit this page.